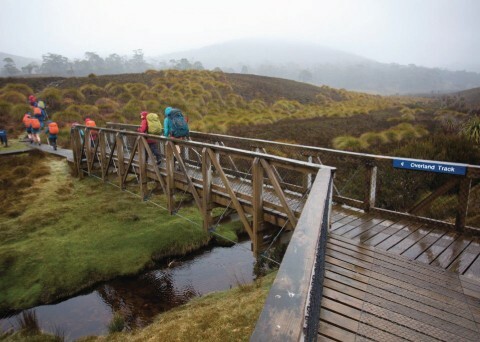 Walking Tasmania's Overland Track is a bucket-list activity for many people. 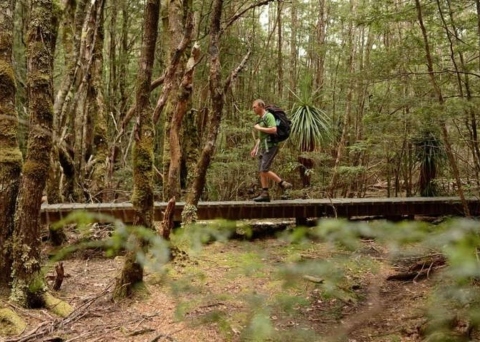 It is a 65 km, 6 day trek through the heart of the Cradle Mountain-Lake St Clair National Park. The track is located in a Tasmanian Wilderness World Heritage Area and, as such, boasts scenery of outstanding natural beauty. This profoundly memorable experience will challenge most and be out of reach for those without a good level of fitness or those unprepared for walking in a remote alpine area. Conditions are unpredictable, regardless of the season, and the terrain is challenging, however this bushwalk will reward even the most seasoned traveller with breathtakingly magnificent scenery. 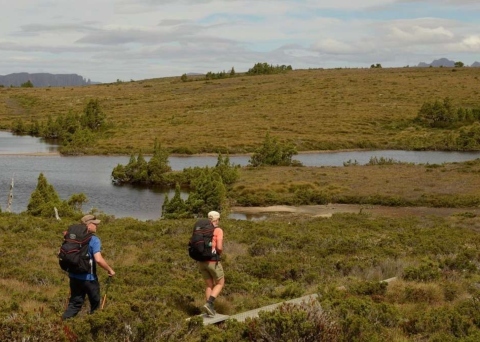 During the booking season (1 October to 31 May) the Overland Track is walked from north to south, starting at Cradle Mountain and finishing at Lake St Clair. Outside the booking season, the track can be walked in either direction. Intrepid travelers are welcome to take on the track independently however many opt for a guided itinerary, of which there are many options, with a variety of associated comforts. Before embarking on the challenge, many walkers find it more relaxing to spend the night at an accommodation venue in Cradle Mountain. This gives plenty of time to check in at the visitor centre and catch the Cradle Shuttle Bus from the visitor centre to the track start at Ronny Creek 7 km away. From there 4 to 6 hours of walking lies ahead before the first hut at Waterfall Valley. Many consider Day 1 to be the most physically demanding section of the walk which most will complete in 4 - 6 hours. The track commences on boardwalk, across beautiful button grass moorland, before rising to pass beside Crater Falls and Crater Lake. This is a good opportunity to rest before undertaking the climb to Marion’s Lookout (1,250 m) – the steepest section of the Overland Track. 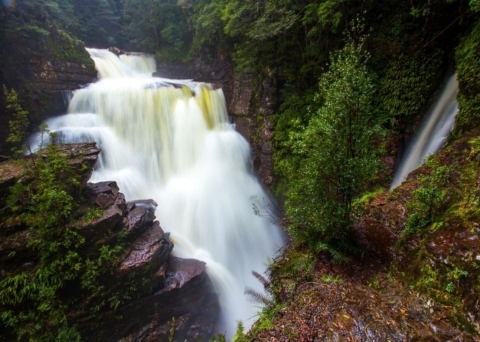 For 5 km you will enjoy dramatic views across the glacial landscape as you amble alongside the base of Cradle Mountain, before steadily descending into the incredible Waterfall Valley where the first night of accommodation awaits. Less distance is covered on Day 2 however there are challenging sections that are exposed to sometimes extreme weather conditions. 7.8 km across rugged heathlands, alpine lakes and button grass plains will take most walkers around 2.5 - 3.5 hours. The varied track is relatively flat and can be taken at a leisurely pace to avoid overexertion at a higher altitude. The track winds through heathland and alpine gums across the rim of the spectacular Waterfall Valley cirque. Continuing from Lake Will to Lake Windermere the track traverses high across the plateau offering expansive views across alpine moors on clear days. A spectacular preview of Lake Windermere is on offer before the track descends to Windermere Hut and campsite just beyond the lake, at the edge of a myrtle forest. A spectacular full day of walking 16.8 km through forests and moorlands across rivers and wide-open plains. The day begins with a brisk 4 km across the heathland and moorland at which point there is an opportunity to take a short side track to Forth Valley Lookout to view into a deep, dramatic valley. Back on the main track, walkers will encounter the beautiful Pine Forest Moor before passing through button grass moorlands and crossing Pelion Creek. 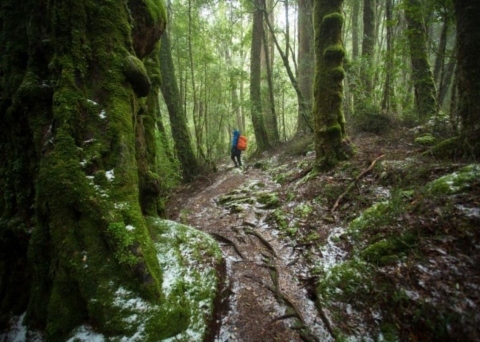 Lush myrtle-beech rainforest awaits on the eastern side of Mt Pelion West as the track gradually descends to Frog Flats – the lowest section of the Overland Track (730m above sea level) where the track crosses the Forth River. There is a campsite here, however most walkers continue to Pelion. From Frog Flats the walk progresses through rainforest before breaking out into the open eucalypt forest on the edge of Pelion Plains. 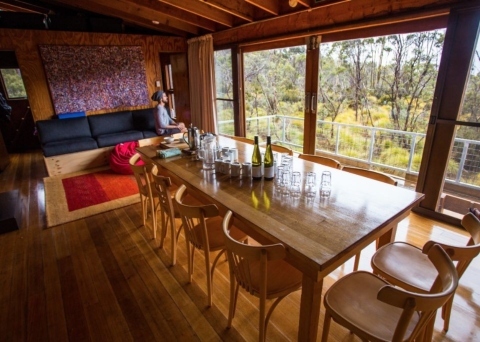 The spacious Pelion Hut is positioned to admire the spectacular dolerite spires of Mt Outleigh. Day 4 begins and ends at the same altitude with various ascents and descents in between. 8.6 km of undulating terrain should take around 3 - 4 hours. The day's walk begins with a gradual ascent along rainforest covered track alongside Douglas Creek. This section of track arrives at the exposed alpine plateau of Pelion Gap between Mt Pelion East and Mt Ossa. An additional climb from here to the summit of either Mt Ossa or Mt Pelion East is possible on fine days. The steady descent from Pelion Gap to Kia Ora Hut winds through beautiful Pinestone Valley with incredible views of Cathedral Mountain. Kia Ora Hut is located in a scenic spot close to Kia Ora Creek. 9.6 km of largely rainforest walking will usually take around 3.5 - 4.5 hours on Day 5. The track passes briefly through button grass, before becoming shrouded by rich rainforest canopy alongside the lower slopes of Castle Crag. Birdsong is accompanied by the dramatic sounds of the Mersey River below crashing through chasms and cliffs, unseen from the track. Along the way the track passes Du Cane Hut, built by snarer, miner and bushman, Paddy Hartnett in 1910. From here onwards there are opportunities to divert from the main path to visit the beautiful D’Alton and Fergusson waterfalls which are both worth a little extra exertion to witness. The main track swings west here and climbs to Du Cane Gap between the Traveller and Du Cane Ranges before descending into the bowl-like cirque of the Du Cane Range, an ancient formation carved out by glaciers thousands of years ago. The path emerges from the rainforest canopy before arriving at the next stop, Windy Ridge and Bert Nichols Hut, surrounded by the imposing splendour of the Du Cane Range. The final day of walking rewards weary travellers with downhill, easy terrain and more exceptional scenery. 9 km should be easily covered within 3 - 4 hours. The track varies in surroundings from dense forest shrubbery to tall eucalypts. As the route winds towards Narcissus River, the dolerite columns of Mount Olympus emerge beyond the golden button grass moorland. This easy section of track allows walkers to meander along, indulging in the scenery before crossing the river on the suspension bridge – the only one on the track. A little way further is the Narcissus Hut where the ferry departs from the jetty to Lake St Clair and Cynthia Bay, the conclusion of an incredible experience on the Overland Track. For those eager for more adventure, it is possible to walk to Cynthia Bay from here but be prepared for another full day’s hike. 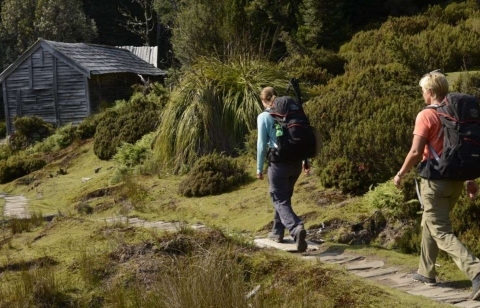 Along the route, six overnight huts and campsites are available for walkers: Waterfall Valley, Windermere, Pelion, Kia Ora, Windy Ridge and Narcissus. Each hut contains bunkbeds without mattresses, tables and bench seats and heating. There are no lighting or cooking facilities. Campsite facilities are basic - tent platforms built to protect the vegetation with wires and nails to provide attachment points for tents, toilets and rainwater tanks. If basic facilities and self-guided walking is not your preference then the Overland Track is best explored in the hands of an experienced and knowledgeable guide. On a guided itinerary, walkers can explore in comfort and leave the logistics to the experts and look forward to a warm bed, hot shower and freshly prepared meal each day. 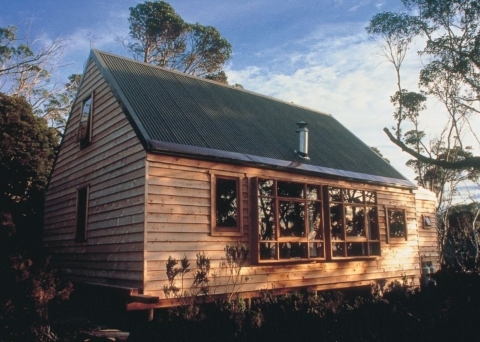 The Cradle Mountain Huts are operated in harmony with this delicate environment, and great lengths are taken to ensure ecological sustainability. On arrival at the end of each day, walkers are greeted with afternoon tea, before taking some time to relax and enjoy the surroundings in advance of a delicious 3-course dinner. 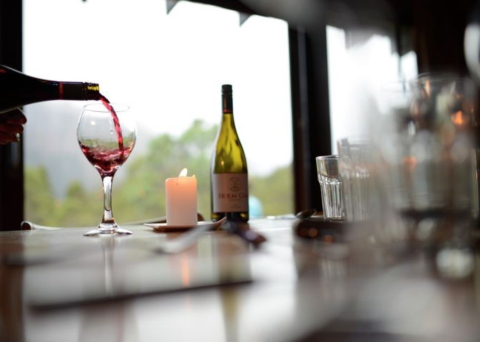 In the evening, an opportunity to compare notes with fellow walkers, curl up with a book in the lounge area or relax on the deck with a glass of Tasmanian wine. View all Cradle Mountain & Overland Track Walks here. View all 6D5N Cradle Mountain Overland Walk here. View all 4D3N Cradle Mountain Overland Walk here.